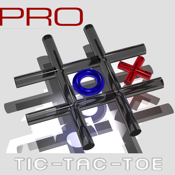 Tic-tac-toe Pro is a game of reflection practicing for one or two players, goal is to create the first alignment. The game is usually played with pencil and paper. The winner is the first player to get an unbroken row of five stones horizontally, vertically, or diagonally. ⋆ Determine the minimum size of a line, from three fields as in TicTacToe up to six fields.